Today I went with my students to have lunch at a Korean restaurant. One of my students had suggested that we go out to lunch together on the last day of class, however he had picked a BBQ restaurant that is not exactly my favorite. Instead I suggested that we go to the Korean restaurant that I had visited for my Korean New Year Lunch. 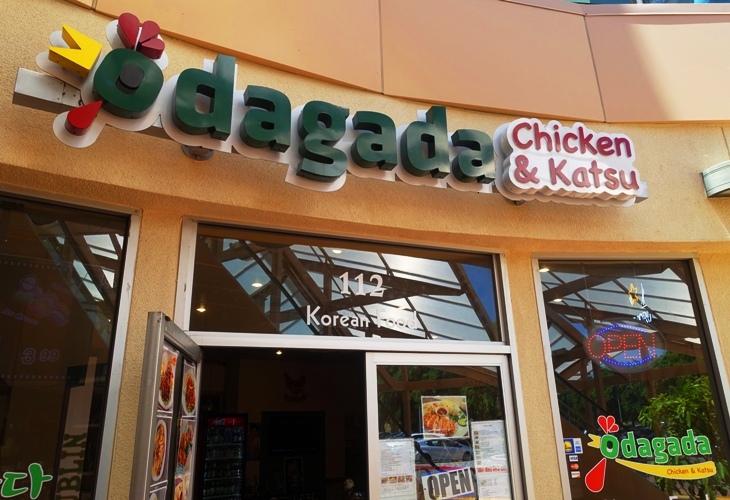 Odagada Chicken is in the Dublin Ulferts Center which has many Asian restaurants. Today as usual we had a difficult time finding a parking place. We almost gave up and went somewhere else, but I am glad that we didn’t. I had the Pork Katsu which is what I had the last time I visited. I thought about trying something else, but I had been remembering this delicious meal for most of the week and was really looking forward to it again. The katsu was cooked just right and was delicious. The breading had a nice crunch and the sauce had a nice taste. The banchan or small dishes that were served with my Katsu were the same as last time, but this is a good thing as they were a nice complement to the meal. On the right is some delicious kimchi, then some noodles and on the left there are spicy cucumbers. The kimchi was nice and spicy and I just had to ask for some more. The waitress had a nice smile as she brought it as she knew I was enjoying my meal. Three of my students had the Beef Bulgogi. This looked really good and I may have to try it on a future trip to Odagada. It brought back some memories of some good bulgogi I had in South Korea. Another student was a bit tentative to try anything new and played it safe with a dish of Chicken Fried Rice. He had never been to a Korean restaurant and I think if he goes to one again he will try something different after seeing what the others ate. We all enjoyed the food, but we then had to hurry back to the office as the students had a certification test to take. Do you have a favorite Korean dish? 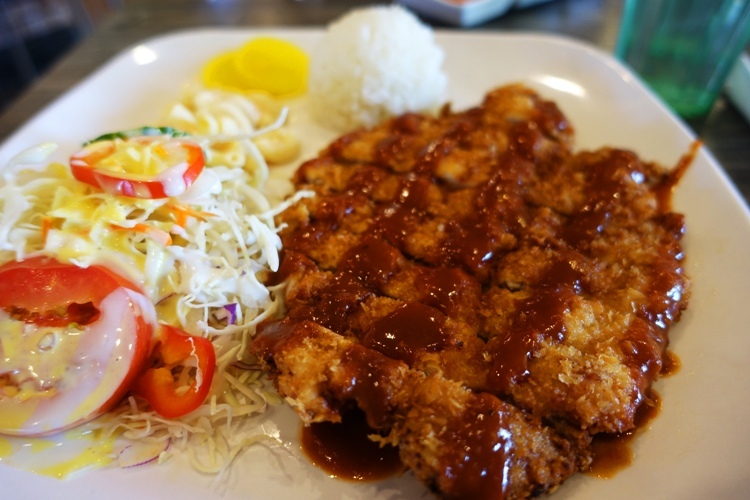 This entry was posted in California, Culture, Food, Korea and tagged Bulgogi, katsu, Korean cuisine, Korean Food, Odagada Chicken, Pork Katsu, Ulferts Center. Bookmark the permalink. Nice photos! 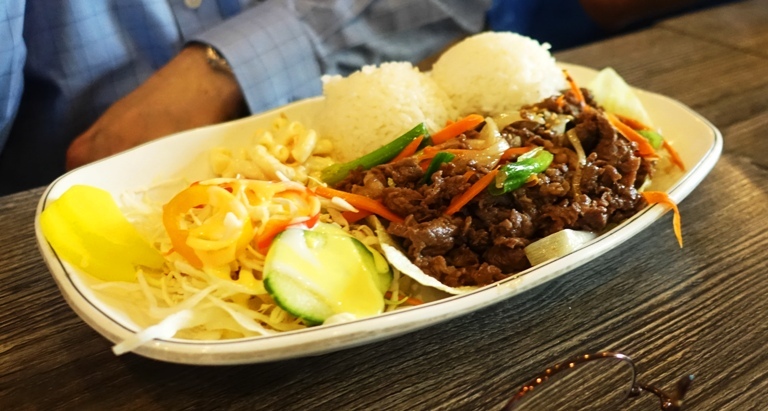 The Dublin pleasanton area has a number of Korean restaurants and Korean cafes. At Korean Village I like the spicy pork lunch, and at Seoul Kamtang I like any of the sizzling plates and will get the seafood pancake to share. At Bob’s house I always get the 6.1 BiBimBop with short rib and at Jung BBQ I get a bit of everything.